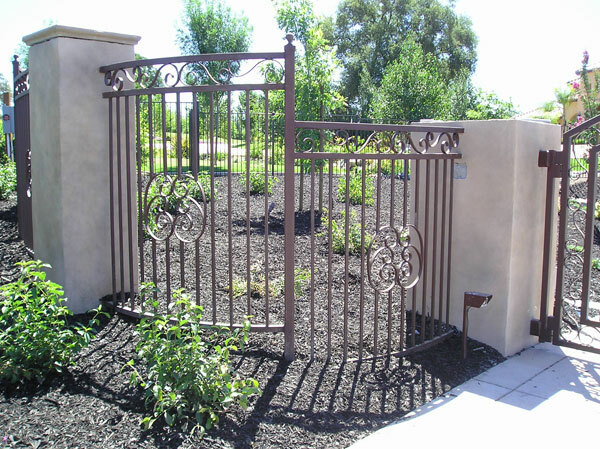 When properly maintained, wrought iron can last a lifetime. This metal is extremely strong, as it has a high carbon content and has been heated to extremely high temperatures. Unlike cast iron, which is poured as a liquid into a mold and is very brittle, wrought iron is actually shaped and stretched into its final form, which means that if extreme force is placed on it again, it will bend and not break. This makes wrought iron far more repairable than cast iron as well, though as we said, it would take extreme force to bend wrought iron and this would certainly not happen in the course of ordinary life. Wrought iron, in fact, has only one enemy: rust. Because of its high carbon content, wrought iron does not become rusty as easily as cast iron, but it still does need to be protected. Your wrought iron fence, railing, or gate from Linmoore Fencing comes already weatherproofed, so you will not need to worry about it for quite some time. It is sufficient to check it periodically to see if there are any rust spots forming, and as long as your wrought iron is still completely black you have nothing to worry about. Also make sure that dirt is not allowed to stand on your wrought iron, since dirt and grit will damage the rust prevention coating and may cause rust later on down the road. If you do notice rust, use a rust treatment product to remove it, and then you can apply a rust prevention paint, or you can simply use linseed oil to protect it for the future. All in all, proper wrought iron maintenance is far less work and far less time-consuming than maintenance on a wooden fence, which you can expect to have to re-paint every couple of years if it stands out in the rain and elements. Even if your wrought iron does begin to rust, all is not lost: a little simple treatment will get it back in safe, working order again and you will be able to enjoy it for many years to come.